To exacerbate the problem, the grinder is held together from the bottom with three odd triangle-headed screws,and is obviously not made to be taken apart by a hacker like me. Ha. That problem was easily overcome with a flat-head precision screwdriver of appropriate size to be trapped in that screw head. Been there before… Now, in this case, there were actually three problems with the grinder. First, the safety interlock switch that stops the grinder from working and removing fingertips when the top cover is off had been moved out of position. That was an easy and obvious thing to fix. However, with that fix, the grinder still didn’t work. It actually started smoking when turned on! The next problem was revealed on further disassembly. Essentially, heat (maybe from extensive use of the grinder – I have no idea how that could have happened…) had melted the base of the top plastic keyed shaft above the motor and effectively welded it to the plastic case of the grinder. That was preventing the motor from turning. I broke the shaft free, sanded the mating rotating surfaces with fine sandpaper, and then put stainless steel washers between the rotating surfaces to attempt to prevent the same problem from happening again. One more action to take to complete this repair. 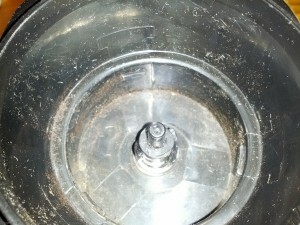 Prior to the total failure, the grinder lid was a poor fit on its moorings, resulting in the grinder shaking the lid loose during grindings and preventing adequate grinding of the coffee beans. 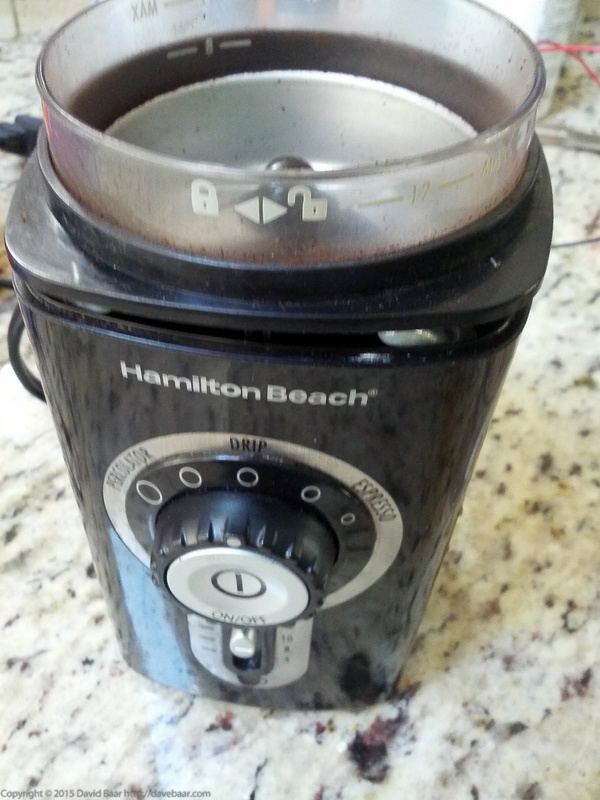 Unacceptable, so I superglued 4 rubber band sections onto the grinder top surface to make the lid fit tighter. Much better! 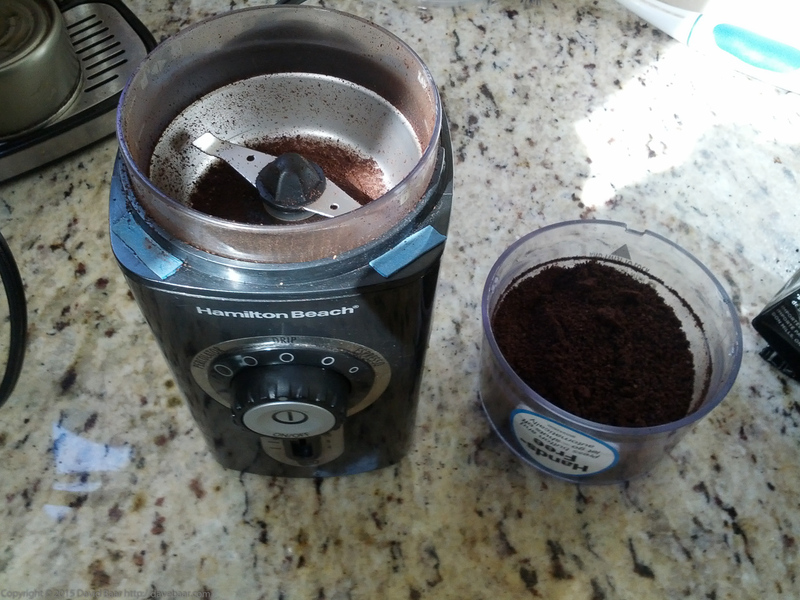 Now the grinder works great . I did a thorough test of it with significant coffee tasting afterward. Thank you for posting this! I have a very similar model, a bit newer, and the same problem. Suddenly stopped working. Step one fixed it, but my machine’s issue was that coffee dust was preventing the switch from connecting. Tested it and everything was fine. 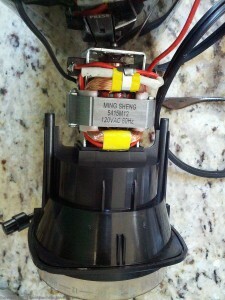 Then I put it all together and found that the motor wouldn’t spin. It was so curious that I ended up with a very similar “part 2″ to my problem, just as you did. Once I broke the plastic head away from the bowl (carefully, with a wrench) I still was confused as to how it melted in the first place. Just like yours. After investigating it hit me: I think we both tested after step 1 without putting the entire assembly back together. When fully assembled, that head actually sits above the plastic “bowl”. By testing before assembling, I think we heated it up, and while we were basking in our glory, the part welded itself together! So, who ever uses this article next, please assemble fully before testing. Thanks, David, for your comment. However, in my case, parts had melted before disassembly. The as-designed, original parts really actually are susceptible to overheating and melting even in normal assembled usage, but it turns out, only after about 8+ consecutive grindings. So, good practice with similar grinders is to let the device cool after perhaps 3-4 grindings max. My coffee grinder has been blade loose after five months or so, I dont’t know how to fix these loose blade, it looks like got melted into the plastic part underneath and broke.. thank you..